Ralph Bunche High School was built as a direct result of the Federal District Court case Margaret Smith et al. v. School Board of King George County, Virginia, which was filed in 1947. The judge ruled that jurisdictions should ensure the “equalization” of segregated school facilities for whites and African Americans. White segregationists hoped to avoid integration by constructing “separate but equal” facilities, but the NAACP quickly moved on to demanding the end of segregation altogether. Named after the noted political scientist and diplomat, Ralph Bunche High School opened in 1949 and closed in 1968 after the county desegregated its schools. First L: Ralph Bunche High School Plaque. R: History Marker. Second L: Ralph Bunch High School. R: High school name above door. Pictures taken November 30, 2013. "Freeman v. County School Board." leagle.com/decision/194824982FSupp167_1216, Web. 11 Nov. 2013.
id=MwNOAAAAIBAJ&sjid=QIwDAAAAIBAJ&pg=5158,5675228, Web. 11 Nov. 2013. %20July%202013/State%20Timeline.pdf, Web. 11 Nov. 2013. Ralph Bunche High School. Shiloh, VA, 30 Nov. 2013. __________________________________________________________________________________________ SUBMITTED: November 30, 2013. Dunbar High School, chartered November of 1870, was one of two public high schools built specifically for black students in Washington, DC. The other, Armstrong Manual Training School, built on the educational principles of Booker T. Washington. Dunbar was also the first high school for blacks in the nation. Notable graduates include Sterling Brown, Nannie Helen Burroughs, Charles R. Drew, Charles Hamilton Houston, Robert H. Terrell, Senator Eleanor Holmes Norton, Senator Edward Brooke and Robert C. Weaver. Faculty members included Anna Julia Cooper, Kelly Miller, Mary Church Terrell, and Dr. Carter G. Woodson. The current Dunbar High School, NW, Washington, DC. Picture taken December 13, 2008. Fitzpatrick Sandra and Goodwin, Maria R. "The guide to Black Washington." New York: Hippocrene Books, 1990. Print. Dunbar High School. Washington, DC, 13 Dec. 2008. On May 17, 1954, the US Supreme Court in Brown v. Board of Education Topeka, Kansas ordered schools throughout the United States to desegregate “…with all deliberate speed.” However, the Court did not give a date for the change to begin. Two years later, public schools in New Orleans were not desegregated. In 1956, Federal District Court Judge J. Skelly Wright ordered the desegregation of New Orleans schools. In May of 1960, after several appeals, Judge Wright ordered New Orleans schools to begin integrating by November 14, 1960. His plan for integrating began with the first grade and with each successive school year, the next grade would be integrated. In the spring of 1960, black kindergarten students took a test to determine which of them would integrate the all white, first grade classes. Six students were selected and four agreed to participate. Leona Tate, Gail Etienne and Tessie Prevost were sent to McDonogh 19 School. Ruby Bridges was the fourth student chosen. White citizens' counsels were outraged and called for a boycott of the schools. By the end of the third week of school, white parents removed all but three children from William Frantz School. At McDonogh 19, none of the white students attended school. Several whites did more than boycott. Ruby’s father was fired from his job and white store owners would not sell to Ruby’s family. Throughout the school year, Ruby was isolated from other students. Her class consisted of just her and her teacher, Barbara Henry. In 1961, Ruby completed the first grade. L: William Frantz Elementary School. Pictures taken April 29, 2011. Bridges, Ruby. "Through My Eye First Edition." New York: Scholastic Press, 1999. Print. Hall, Kermi, L. and Ely Jr, James, W., "Brown v. Board of Education The Oxford Guide to United States Supreme Court Decisions." Second Edition. New York: Oxford, 2009. Print. "Brown v. Board of Education at Fifty." loc.gov/exhibits/brown/brown-overview.html, Web. 10 Oct. 2011.
peopleevents/e_integration.html, Web. 10 Oct. 2011. 27/14353872/, Web. 10 Oct. 2011.
lessons/brown-v-board/, Web. 10 Oct. 2011. "Brown v. Board of Education." archives.gov/education/lessons/brown-v-board/images/decision.jpg, Web. 10 Oct.
William Frantz School. New Orleans, LA. 29 Apr. 2011. 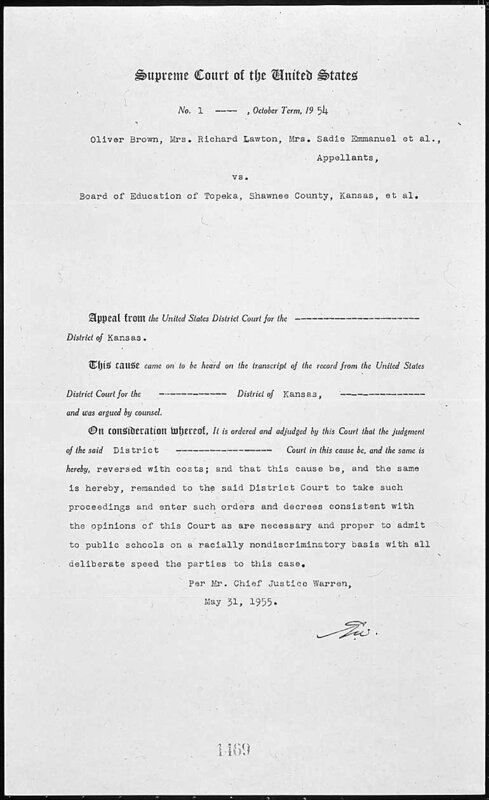 On May 17, 1954, the U.S. Supreme Court in Brown v. Board of Education of Topeka, Kansas ordered schools throughout the United States to desegregate “…with all deliberate speed.” However, the Court did not give a date for the change to begin. Three years later, Little Rock Central High School was not desegregated. On August 23, 1954, the NAACP petitioned Little Rock School Board for the immediate integration of schools. However, on May 24, 1955, Little Rock School Board accepted a plan put forth by Virgil Blossom, Superintendent of schools, to slowly begin integrating starting with the high schools, with lower schools to be included over the following six years. In a lawsuit Arron v. Cooper February 8, 1956, the federal Court agreed with Little Rock School Board and dismissed the NAACP suit. The case was appealed and upheld by the Eighth Circuit Court of Appeals. In addition, Blossom’s plan was made a court mandate. On August 29, a motion made by the segregationist’s group Mother’s League of Central High School to stop the integration is granted and an injunction administered barring the School Board from integrating schools. Shortly thereafter, federal Judge Ronald Davies nullifies the injunction and orders the School Board to continue with its plans for desegregation. Defying a federal court order, on September 2, 1957, governor Orval Faubus activated the Arkansas National Guard and had them block the entrance to Little Rock Central High School. In a press conference on the same day, he cited the need to "maintain and restore order" and went on to say Little Rock's schools "must be operated on the same basis as they have been in the past." On September 20, the federal court orders the National Guard to be removed. Faubus replaced the National Guard and the Little Rock Police Department. On September 23, 1957, nine black students Minnijean Brown, Elizabeth Eckford, Earnest Green, Thelma Mothershed, Melba Partillio, Gloria Ray, Terrance Roberts, Jefferson Thomas and Carlotta Walls entered Little Rock Central High School undetected and escorted by Little Rock Police through the side door. In front of the school stood a crowd of whites opposed to desegregation. They had heard black students would attempt to enter the school. When the crowd discovered what they heard was true, they became hostile and the students were escorted out of the building. On September 24, the Mayor of Little Rock, Woodrow Wilson Mann sent a telegram to President Dwight D. Eisenhower requesting he immediately send federal troops to Little Rock to help maintain order and democracy. Later that day, the president issued Executive Order 10730, federalizing the entire Arkansas National Guard and ordered them to Little Rock. On September 25, 1957, the nine black students entered Little Rock Central High School under the security of soldiers from the 101st Airborne Division of the National Guard. In the spring of 1958, Earnest Green was the first black to graduate from Little Rock Central High School. Little Rock Central High School, 2120 Daisy Bates Drive, Little Rock, AR 72202, Visitor Center 501-374-1957. Pictures taken December 27, 2005. Charles Guggenheim. "Nine From Little Rock. ", Guggenheim Productions Inc., 2005. DVD. "Civil Rights: The Little Rock School Integration Crisis." eisenhower.archives.gov/index.html, Web. 16 Dec. 2005. "Little Rock Central High School." nps.gov/nr/travel/civilrights/ak1.htm, Web. 16 Dec. 2005. Little Rock Central High School. Little Rock, AR. 27 Dec. 2005. On this site of the former Robert R. Moton High School, the actions of some brave African-American students to achieve equal educational opportunities eventually lead to the end of legal segregation in American public schools. Moton was built to house 180 black students. On April 23, 1951, it held 450 instead, with some classes conducted in ‘Tar Paper Shacks,’ resulting in student walkout protesting the unequal facilities, course offerings and buses. Within weeks the students sought legal redress of their grievances. The NAACP agreed to support a suit for school integration, believing that goal to be in the best interest of the community. The subsequent case Davis et al. v. County School Board of Prince Edward, was decided by the United States Supreme Court in 1954 in its landmark Brown v. Board decision, which stated that “in the field of public education the doctrine of ‘separate but equal’ has no place. A second Brown Decision in 1955 mandated that integration be achieved “with all deliberate speed. Rather than integrate its public schools, Prince Edward County withheld funds for all public education. As a result, all of the county’s public schools were closed from 1959 until 1964, when the Supreme Court ruled in Griffin v. Prince Edward County that localities must fund and operate public schools. Today, Prince Edward’s fully integrated public schools bear the legacy of a fight for civil rights in education that began here with a courageous, non-violent act by a group of high school students and resulted in three historic United States Supreme Court rulings. In 1998 the site was designated a National Historic Landmark. In 2001 it formally opened as a museum. Also, see Brown v. Board of Education. First L: Robert R. Moton School/Museum. R: Moton High School c.1953. The tar paper buildings added to expand the capacity of the school can be seen on the left and right. Second L: Students arrive for school at tar paper building, c.1953. M: Moton High School student's sign demonstrating their determination to get a new school building. The students walked out of their classes April 23, 1951, beginning a two weeks strike. R: Class in tar paper building, c.1953. Third L: Rev. L. Francis Griffin Sr. led the Moton High School students in their protest against unequal facilities, course offerings, and buses. M: Stone marker in front of the museum dedicated to the students of Moton High School. R: The students of Moton High School as pictured on stone maker. All pictures except those of Robert Moton School and Museum are pictures taken of sections of memorials located on museum grounds. Pictures taken October 25, 2008. Robert R. Moton School/Museum Tour. Farmville, VA. 25 Dec. 2008. On April 23, 1951, 16-year-old Barbara Johns and several fellow students led a strike to protest the deplorable conditions at their racially segregated Prince Edward County School. The Rev. L Francis Griffin united parents in support of the strike and encouraged the students to contact NAACP attorneys Oliver Hill and Spottswood Robinson. The lawsuit that followed was brought before the U.S. Supreme Court and joined with four other cases as Brown v. Board of Education of Topeka Kansas (1954), in which the Court ruled that racially separate educational systems are inherently unequal and unconstitutional. This memorial is dedicated to these Virginians and countless others who courageously fought for the principals upon which the nation and this Commonwealth were founded. Memorial to Barbara Johns and the Students of R. R. Moton High School. Pictures taken September 11, 2010. Memorial to Barbara Johns and the Students of R. R. Moton High School. Richmond, VA. 11 Sept. 2010. Memorial to Barbara Johns and the Students of R. R. Moton High School continued. Smithfield Schoolhouse, originally built as an addition to the Christian Home School around 1924, was first located on two acres of land in eastern Isle of Wight County, Virginia near Chuckatuck. Construction of the addition was financed in part by the Rosenwald Fund. Named after Julius Rosenwald, part owner and president of Sears & Roebuck Company, the Rosenwald Fund promoted the "well being of mankind." Rosenwald supported the doctrine of separate but equal. However, he gave millions of dollars to support the education of African Americans by financing the construction of more than 5,000 schools and 4,000 school libraries throughout rural areas of the southern United States. Rosenwald donated $4.3 million. That amount was matched and exceeded by the $4.7 million raised by African American communities. Schools receiving funds became known as Rosenwald Schools. Many of them are still standing today. Some have been rehabilitated while others are in varying degrees of disrepair. Many have been demolished. First L: The Schoolhouse Museum. R: Smithfield Schoolhouse Painting. Second L: Outhouse. R: Sign in front of building. Third L: View from inside the school. M/L: Elementary school graduation diploma. M: African American teacher's contract. M/R: George W. Gwaltney and students. In 1870, Mr. Gwaltney fully financed and built the pictured school. He made his own blackboards and maps and retired in the 1920's. R: Julius Rosenwald. Pictures taken October 23, 2010. Wellons, Phyllis J. The Schoolhouse Museum. Smithfield, VA. October 23, 2010. Discussion. The Schoolhouse Museum. Smithfield, VA. 23 Oct. 2010.